ZU4 Series portable electric pumps by Enerpac, are built to run all sizes of hydraulic cylinders and tools wherever high speed, intermittent duty, remote hydraulic power is needed. Enerpac Z-Class pumps are available in Classic, Standard Electric, and Pro Electric model designs. 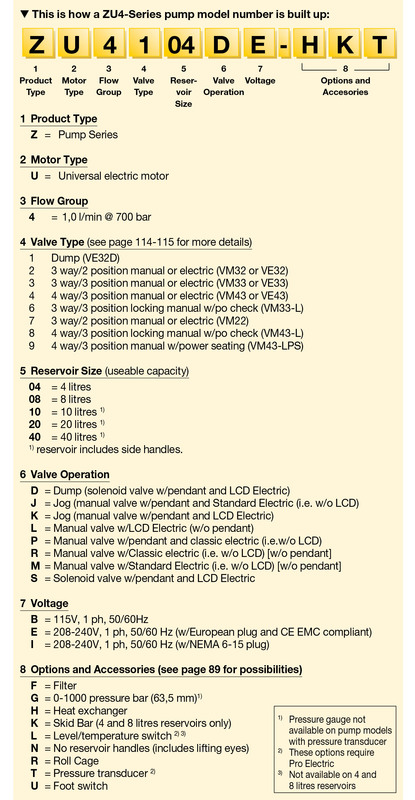 Pumps types are available with a variety of valve options including manual, manual with pendant, dump valve and solenoid valve. Z-Class pumps are ideal for use in applications using long hose runs and high pressure-drop circuits. These Enerpac electric pumps are especially well-suited for heavy lifting or for use with certain double acting tools. Please call store at 1-800-823-4937 to speak with a hydraulic representative on selecting the correct portable Enerpac electric pump.